The Eld, the glyph symbolizing the Mantle of Responsibility, one of the most common Forerunner glyphs. The Forerunners used several forms of symbols and glyphs to convey a variety of meanings. These symbols can be found on Forerunner technology and within Forerunner installations, including the Halo Array. The Covenant later adopted these symbols for their writing system as well as religious imagery and as such, they are also commonly seen in Covenant technology and architecture. While the specifics of Forerunner languages such as Jagon and Digon remain a mystery, with only a handful of words known, the writing system they used to convey meaning is far better understood. The Forerunners appear to have used two different writing methods; the first was a system of glyphs or logograms, rather than parts of an alphabet, highly contextual in nature, with the meaning of different glyphs altered by order and context, and further meaning could be derived if the reader used more three-dimensional interpretations; when combined with different glyphs, a symbol might have radically different meanings, making individual glyphs pictograms or ideograms. The second mode seems to be a more conventional writing system, using two-dimensional characters. There appear to be at least two variations of this conventional script. One type, observed in Forerunner relics on Installation 00, either inscribed onto stone relics or in holographic form, involves highly complex characters resembling digital patterns or bar codes written vertically. In the other writing system, the characters are considerably simpler, consisting of a series of dots, squares, bars and triangles. The Covenant script is derived from the latter, although they use highly embellished variations of the original characters used by the Forerunners. Other symbols found on Forerunner relics and structures are even less obvious in their meanings. They are obviously decorative in nature, but they are often larger and more elaborate in nature than their glyphs, and may depict specific shapes and forms, and may have more in common with petroglyphs than logograms. The glyph system was also adopted by the Covenant as religious symbols, despite having little idea as to the true meanings of the original symbols; the most notorious example is their mistranslation of the "Reclaimer" glyph as meaning "Reclamation". Forerunner glyphs are found on Covenant Luminaries as indicators of Forerunner relics, as the Reclaimer glyph was seen to represent humans on Harvest. Humans in general have had little success in translating Forerunner texts, with the notable exception of Dr. Catherine Halsey. Indeed, it took nearly five years to decode glyphs recovered during the Battle of New Mombasa. The glyph representing the Mantle of Responsibility, the main belief system of the Forerunners, is perhaps the most ancient and ubiquitous Forerunner glyph. Known as the Eld or the Tree-mark due to its resemblance to a heavily stylized tree, the symbol appears frequently on Forerunner structures and installations due to the Mantle's all-encompassing nature in Forerunner society. Among many other sites, this symbol appears inside and outside Installation 04's Silent Cartographer, as well as on Installation 05 in various areas. It also appears on the Ark's surface, if viewed from space. It also makes an appearance in the Terminals throughout the Ark. The symbol also appears on top of a Monitor's "head" and behind the "eye" on the center orb. The surface of Requiem also bears the symbol, and the symbol is found in a wall on Requiem, accompanied by the inscription "Guardianship for all living things lies with those whose evolution is most complete. The Mantle of Responsibility shelters all.". A similar symbol was found on Installation 03 and moved to Ivanoff Station to be studied. Eld under Installation 04's Cartographer. The Mantle symbol in the Deep-Space Anomaly #0198. The Mantle symbol on the Ark's surface. 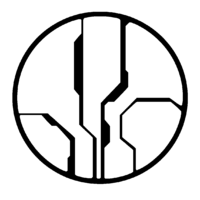 An engraving of the Mantle symbol on Installation 05. Eld on one of the "fins" of the Babd Catha Forerunner vessel. Shield Worlds are represented by a symbol described as a "double-lobed icon". The symbol was described when Dr. Halsey was compiling her data with the AI Endless Summer. While Dr. Halsey was working, CPO Mendez asked her what the symbols on the screen are. Dr. Halsey replied that they are Forerunner symbols from the ruins on Onyx, and their theoretical translations. As she continued to work, Mendez then asked the meaning of a double-lobed glyph. Dr. Halsey replied that the symbol, roughly translated, means Shield World. The Forerunner glyph representing a Reclaimer is identical to the Marathon symbol, although the same symbol appears to have been in common use in Forerunner constructs, including the "eye" of 343 Guilty Spark, as well as the frontal section of an Enforcer. However, after Halo: Reach, later media featured a more vague appearance of the original symbol. The original Marathon symbol is also used by humans in various instances, and it is the ship emblem of the UNSC Pillar of Autumn. It is unknown if this is simply a coincidence, or if there is a relation to their status as Reclaimers. The Reclaimer glyph on a Requiem control panel. A sigil is a symbol representing a specific Forerunner, ancilla, or any other entity. They were often used to label transmissions, or to indicate affiliation with a given individual; for example, members of Master Builder Faber's personal security carried his sigil. Forerunners and ancilla have been known to change their sigils on some occasions; for example, the Ur-Didact's sigil being changed to an "unbound" state at some point after his fall from grace, and the Warden Eternal's sigil gaining a second ring. The second avatar of AdjutantReflex on Bungie.net. In the Ark's Citadel, where the Prophet of Truth attempted to fire the seven Installations, each Installation is shown in detail. Each Halo has its own hologram showing its structure and status, as well as a holographic symbol identifying each Installation. If the installation's fail safe protocol is activated, when the installations are all in communication the symbols all come back as white. In the case an installation is destroyed or contact is fully lost with it, the symbol used to describe it is red as shown with Installation 04. Kappa Halo's communication confirmed symbol. Alpha Halo's communication failed symbol. The Forerunners have been currently shown to use 7 different type of writing systems. The following are shown below. These symbols can often be found in hexagons. The first type is the rectangle ones. The rectangle ones are seen in records the Forerunners have made. Rectangle type symbols commonly have a bracket round them. Inside the brackets are small boxes. These range from 1-6 small ones, 1 to 4 medium ones, 1 to 3 medium sized ones, 1 to 2 big ones, or none at all. It has been noted that the top bracket is not always there. In that case there is either no boxes at all, or small boxes 1-6 would be inside the bracket. Forerunner sigils are able to be used as normal characters in this. A record of Forerunner weaponry, with the rectangle-type symbols making the names of the weapons. Symbols used during the Halo 4 #EvilAwakens marketing campaign. Close analysis of the symbols used during the Halo 4 #EvilAwakens marketing campaign. Expanded analysis of the symbols used during the Halo 4 #EvilAwakens marketing campaign. The second type is the hexagon type ones. The hexagon ones can appear without a hexagon around them but are more mostly seen with them around. These are seen in Forerunner signals and codes, and also control panels. Images are also known to be inside the hexagon type symbols as images in terminals. Forerunner symbols that can make an alphabet if used in certain ways. Used in numerous places including control panels on forerunner devices. Two possible ciphers for the hexagon symbols used in the Section 3 ARG. A glyph used in Hunt the Signal that was used to find the Signal that led to the discovery of the Guardian sigil. A glyph used in the Section 3 ARG. A transmission from the artifact on Sigma Octanus IV with the hexagon symbols in it. Shield World 0459's Apex Site control panel with the hexagon symbols in it. X50's control panel with the hexagon symbols in it. Installation symbol with two hexagon symbols at the top corner of it. The third type is the circular type. The circular type can be seen with being in a circular pattern and has been seen on their own. These are seen in Forerunner co-ordinates, control panels, and several Forerunner artifacts. These are often circle round a Forerunner sigil. This type was also seen in the Halo 4: Promethean Weapons Trailer, where the Promethean weapons were looked over. Forerunner sigils can be used as normal characters in this writing type. A complete alphabet of this language. "Assertion of control" Seen when 343 Guilty Spark contacts the UNSC Pillar of Autumn. "Bio Scan Begin - End" Seen in a transmission in which 343 Guilty Spark lowered Installation 04's security to let the UNSC Pillar of Autumn though. "Trespass is doom Reclaimer". Forerunner symbols put on numerous official Facebook pages during Halo 4's marketing. Eld with the inscription, "Guardianship for all living things lies with those whose evolution is most complete. The Mantle of Responsibility shelters all." How the Eld says "Guardianship for all living things lies with those whose evolution is most complete. The Mantle of Responsibility shelters all." The co-ordinates to Requiem that were found on Gamma Halo. That make a almost complete alphabet. Note letters "I", "J", "K", "L" don't appear. "Techlink Established Forerunner" on one of the Requiem slipspace artifacts. A symbol on a control panel on Requiem. A different Control panel on Requiem. The words "Shield", "On", "Off", and "Power" appear on it. A Forerunner starmap with the circular type symbols near a system. Binary Rifle zoom symbols. Small hexagon equals medium range zoom. Large hexagon equals long range zoom. The fourth type is the scripture type. These are found on Forerunner ruins and holograms. There is three distinct sets: broad glyphs, LED-like glyphs, and circuit board-like glyphs. Forerunner script engraved onto a stone structure with energy going though it. The same scripture as the one on the stone, but as a hologram wall. Forerunner script on a hologram of the Halo rings on Installation 05. An old analysis of the scripture-type glyphs. The fifth type is the planet type. These are only found on planet records. Infestation of a planet with the planet type symbols at the top. The sixth type is the line type. These are seen on Forerunner control panels and co-ordinate. "01910876" as seen on Requiem control panels. "1" used to signify a signal on Requiem. "117" is seen when Cortana is confused about the Knights appearing for the first time. The line type symbol 0-9 seen round the co-ordinates to Requiem. Roland translating the co-ordinates to Genesis. The seventh type has only appeared in the stone object found at Côte d'Azur Museum of Natural History. This type is known to transmit hexagon type symbols out of it. Analysis of existing small line type symbols. Brute wallpaper for Halo 2 with the symbols. Symbols that appear in Sadie's Story. A look as the artifact. Halsey checking to see if there is a link between this and the standard circle glyphs. The symbols are primarily composed of circles and curves. Each glyph appears to use a circle as a base shape, often combined with either a concentric circle or fragments of one. Another common trait is the presence of one or more circular arcs whose osculating circles' centers lie on the base circle. Non-circular arcs and small non-concentric circles can be seen on some glyphs. The filling in of areas is uncommon but has been seen in Forerunner glyphs. According to Bungie employee Joseph Staten, the blue and red signs denote the safety of the area — that is, whether or not the Flood are present. [verification needed] However, this has only been noted when there are two red symbols together. As singular red symbols can mean something else as noted by them appearing in numerous locations on Installation 04 not linked to the Flood. Several of the symbols are variations of each other, or simply rotated versions of one. Symbols that appear on Installation 04's Cartographer. These symbols are seen on Installation 04's control room. Glyph patterns seen in one of Installation 04's Flood containment facilities. Glyph pairs for all Halo Combat Evolved's maps. All glyphs seen on Installation 04. Glyphs that appeared before ships are shot down. Circle glyphs that appeared in Line Installation 1-4's systems. More glyphs that appeared in Line Installation 1-4's systems. In several places linked to the Domain several glyphs appear after Fireteam Osiris activate a console in them. Currently glyphs of this type have appeared on Kamchatka and Genesis. The following glyphs and sigils have appeared. The Guardian sigil on Kamchatka. A blue glyph similar to the Warden Eternal's sigil on Kamchatka. An unknown Forerunner glyph on Kamchatka. An unknown Forerunner glyph on Genesis that appeared when a auxiliary station was activated. These Forerunner symbols are featured on some installations, and also used as a key to open doors in Shield World 0459. The avatar of AdjutantReflex on Bungie.net. The glyphs discovered in Iris. The Iris symbol N'chala saw and carved on Earth. The glyphs used to open the interior doors of Shield World 0459. A glyph in Cortana's eye. Iris symbol on Mendicant Bias. The Iris-like symbols on an Forerunner planet as seen in 343 Guilty Spark's memory before it is wiped. These are symbols seen throughout Forerunner locations. Glyphs seen in the Bestiarum and Halo 3 manuals. Symbols used to open doors on Halo Wars's multiplayer level Release. Halsey's research into several of the circle glyphs. Cortana going into several of the circle glyphs. Unknown glyph located in the room the Monitors met before they left the Ark. Around several Halo installations and Forerunner relics there are numerous murals and symbols on walls. An undefined Forerunner symbol on Installation 05. A mural engraved in a wall on Installation 05. A similar mural was present in Installation 04's Silent Cartographer. Holographic version of the mural that is engraved on numerous locations on Forerunner relics. A mural engraved in a wall on Installation 05. This has been seen in red, blue, yellow, green, and without colour. A circle symbol seen on numerous Forerunner planets and relics. Murals seen on the Halo 3 map Sandtrap. In Halo 5: Guardians, numerous Forerunner symbols are applied into REQ card emblems. The Librarian emblem in its original default colors. The Reclaimer emblem and banner in Halo 5 in its original default colors. Unknown symbols on a REQ card called "Glyphs". Symbols on the emblem called "Glyphs" in a green color. The Covenant have adapted many Forerunner symbols to their own uses. Some uses include putting the symbols on armor and weaponry. Covenant Forerunner symbols as seen on Halo2.com. Small line-type symbols as seen on a Halo 2 marketing poster. Sangheili speech represented by Forerunner glyphs. Symbol pattern used by the Covenant for Harvest. Cyan symbol that appears on a switch in Halo Reach. The Glyph of Faith carved on the surface of Kholo. Two Forerunner type glyphs appearing on a Covenant communication node. A Sangheili interpretation of a Guardian sigil. The non-glowing cyan symbol is found on the back of Stealth Sangheili and Sangheili Zealots. Sangheili Minor harnesses emblazoned with Forerunner glyphs. White symbol that appears on the Sangheili armor in Halo Reach. 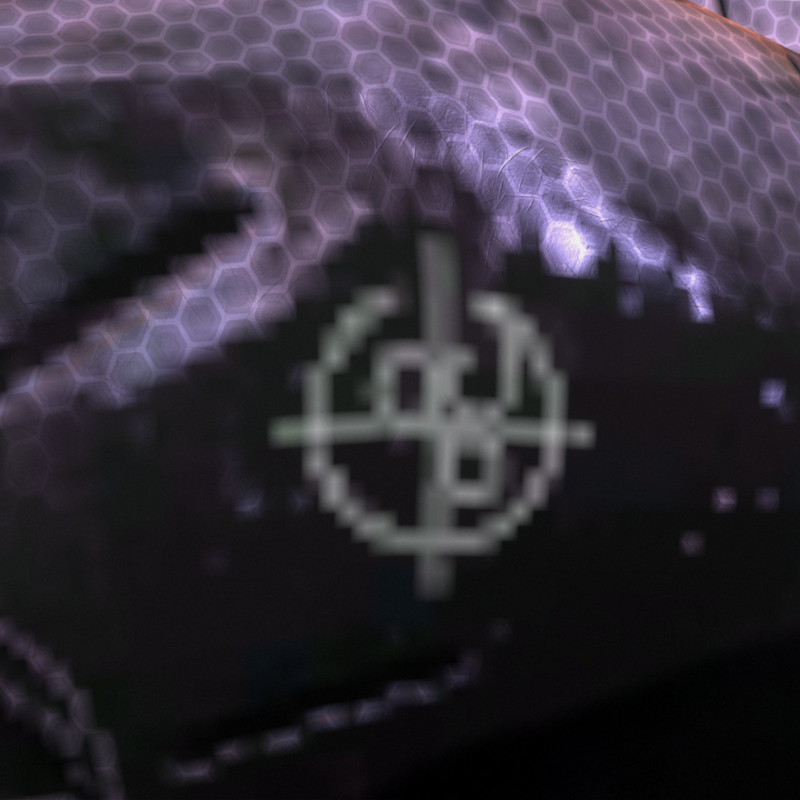 White symbol that appears on Grunts in numerous games. Two symbols painted on Sangheili armor. Symbol used on the Prophets' anti-gravity chairs. Green plasma grenade symbol in Halo CE. Green plasma grenade symbol in Halo 2. Green plasma grenade symbol in Halo 3. Energy sword hilt with Forerunner symbols on it. Green plasma grenade symbol in Halo Reach. Symbol that appears on the Type-52 Phantom in Halo Reach. Weapons in Halo Reach with Forerunner symbols on them. Forerunner mural tattooed on a Brute in Halo Reach. A symbol that appears in the inner-workings of the Kig-Yar point defense gauntlet that closely resembles that of the Iris artifact glyphs. Energy sword symbols in Halo 4. Green plasma grenade symbol projecting the symbol for Installation 04. Covenant Huragok have during the Battle of Mombasa been noted to use similar glyphs to that of Forerunner Engineers, though there has been some deviation due to time. Many of the symbols depict the New Mombasa Superintendent's avatar, as some of the Huragok deployed to New Mombasa were in contact with the AI. The following glyphs are used in several locations, but it is unknown who put them there. Hand-drawn glyphs on the map Warlord. Cut symbols in the Halo Combat Evolved Anniversary Terminals. Cut render of the Lightrifle that had the Line type symbols "34-1112" on it. Forerunner control panel concept art. Cut Halo 2: Anniversary Terminal symbols. Forerunner and Sangheili symbols in the Art of Halo 5 book. The base numerical glyph was used as an avatar by AdjutantReflex. ↑ The Rectangle type symbols in the Halo 3 terminals are all random and do not go towards any specific letter or number. This can be assumed that the terminal is struggling to translate the English words, giving an error with the wrong symbols popping up.